There are many remarkable advantages to camping in a van which we have extolled here in the Vanlife blog again and again, chiefly having the comforts of an RV with the frugality, mobility and maneuverability of a van. There are some facts of Van Life that must be addressed in order to make that compromise enjoyable, however, and one of the biggest is being good at keeping your campervan space organized. Even if meticulous cleanliness and organization aren’t your first priority in daily life, for your campervan adventure, they’ll be essential. It seems obvious, but many people get so into the idea of being spontaneous and adventurous that they forget to carefully plan what they’ll bring, and how they’ll keep it organized in the van. Not you, though, wise van camper, because you have found your way to this blog post. 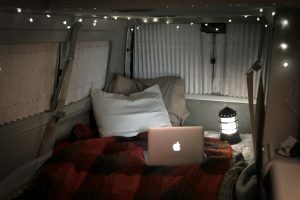 Here are a few key tips on how to make your stint in the Van Life efficient, uncluttered, and the most fun it can possibly be. Yes, while bringing organizer containers is technically bringing more stuff, it actually creates more space in the van, by keeping everything contained and grouped together. There’s no end to the variety of containers you can use, but generally smaller ones are better, as large totes won’t likely fit into any of the cabinet or drawer spaces in the van. The key here is to bring a variety of pouches, bags, bins, and other containers. Additionally, when most of your items are pre-packed into the containers before you ever leave the house, then when you pick up your van, it’s easy to “move in” and get going. Food is a category of item which is particularly at risk of getting messy fast. When you’re in the midst of cooking and eating meals, you may be tempted to approach the process the way you would at home, but this can be problematic. There’s far less room in a campervan than there is at home, so its important that you bring plenty of containers, bags, and wraps like tin foil or plastic wrap for your food items. This is a general principle which is helpful for cleanliness throughout life, but is especially important when living the van life. The idea is simply that when you use something, you should clean it if necessary and put it back where it goes immediately. This goes for dishes, toiletries, clothing, and anything else you use which you may be tempted to leave lying around. If you put this principle into practice, you will have a much tider and happier van experience, guaranteed. Many things can be removed from their unnecessary packaging, to reduce the storage space they take up. The quintessential example of this is cereal boxes, and other food items in boxes, like saltine crackers. Remove the product from it’s bulky container, recycle the box, and save yourself some space. It’s always a good idea to have lots of bags around, whether they’re nice totes or just recycled grocery bags. These come in very handy in a variety of contexts, and life is just always simpler when you have something to carry around your dirty clothes, food, trash, etc. While we’d like to think your trip will be dry and full of sunshine, there’s a chance it may get rainy out there. In case it does, it’s a good idea to have a bin where you can put dirty items, like muddy shoes, or raincoats. In the case that it doesn’t rain, you can use this bin for other purposes, but it should be water-tight for those rainy situations.